1. Why won't some icons change? 2. Why can't I right click an icon to change with FolderMagic? 3. Why do the icons I add to FolderMagic look fuzzy when I use them on my Desktop? 5. How do I uninstall Folder Magic? 6. Is FolderMagic compatible with all versions of Windows? 7. Why do you say FolderMagic includes hundreds of icons? I only see a few. 8. Why can't I drag icons from the web to add to FolderMagic? Question 1: Why won't some icons change? You CANNOT change the icon for System folders like Recycle Bin, My Computer, Documents, and so on. This is due to Windows restrictions. Question 2: Why can't I right click to change a folder in FolderMagic? Note: Due to security changes in Windows 7, 8 and 10,you must open FolderMagic to make changes. Question 3:Why do the icons I add to FolderMagic look fuzzy when I use them on my Desktop? You should use multi-format/complex icons as they contain many sizes. See our tutorials page for more information about complex icons and creating your own FolderMagic collections. Question 4: I want to change a folder back to what it was originally; how do I do this? Open Folder Magic and browse to the folder you want to change back and choose restore to default. OPTION: You can go into the folder and delete the folder icon though, as FolderMagic places a copy of the icon in the folder you change. Question 5: How do I uninstall FolderMagic? Click Start, All Programs, find FolderMagic in the list and choose Uninstall. Or, click Start, Control Panel, Add/Remove Programs. Find FolderMagic in the list and choose remove. Question #6: Is FolderMagic compatible with all versions of Windows? Yes, from XP to Windows 10. Question #7: Why do you say FolderMagic includes hundreds of icons? I can only see a few. Question #8: Why can't I drag icons from the web to add to FolderMagic? The only kind of icons that work well are multi-format (or complex) icons. Multi-format icons are .ico files that contain several different sizes. 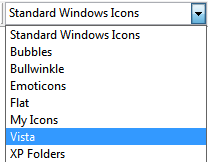 This allows Windows to resize icons on your computer to larger or smaller sizes without distorting. If you notice icons that you've downloaded have fuzzy edges when you use them in FolderMagic to change the icons of folders on your computer, they probably are not multi-format icons. Most sites which sell or distribute icons will mention if they are multi-format icons. Multi-format icons are the only icons you can use that will resize without distorting. Keep this in mind when searching for or purchasing icons on the Web.